It won’t be long before flu season is upon us, and the U.S. Food and Drug Administration (FDA), has now approved the new 2012-2013 vaccines. Each year experts study influenza virus samples and global disease patterns to identify virus strains that are most likely to cause the most illness during the upcoming flu season. The H1N1 virus is the same as the 2011-2012 influenza virus vaccine but the H3N2 and B viruses are different from last year. Vaccination remains the cornerstone of preventing influenza, a contagious respiratory disease caused by different influenza viruses infecting the nose, throat and lungs. This year’s seasonal vaccines will provide protection against the three influenza virus strains that global surveillance indicates are likely to be the most common strains circulating during the upcoming season. While the there is no guarantee that the new vaccine will prevent people from getting the flu, the vaccine may reduce the severity of the illness or may help prevent flu-related complications. The Centers for Disease Control and Prevention recommends that everyone get the flu vaccine before the flu season gets under way. Winter is usually considered the “flu season” but there have been reported outbreaks as early as October, which is only 2 months from now. Who should definitely get the vaccine? Children over 6 months of age. Anyone who lives with or cares for others who are at high risk of developing serious complications. This includes: household contacts and caregivers of people with certain medical conditions including asthma, diabetes, and chronic lung disease. Anyone who works with the public. 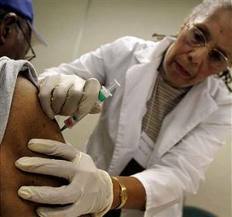 There are some people who should not get the flu vaccine such as anyone who has had a severe allergic reaction to eggs, anyone who has had a serious reaction to a previous flu shot, and anyone who has had Guillain-Barré Syndrome (a severe paralytic illness, also called GBS) that occurred after receiving influenza vaccine. Your doctor will help you decide whether the vaccine is recommended for you. We all know how quickly a cold or the flu can spread in a family. It only takes one member to start a chain reaction. Be vigilant about protecting yourself and your family by making sure that every member gets this year’s flu vaccine.